How to watch Now You See Me (2013) on Netflix South Korea! Sorry, Now You See Me is not available on South Korean Netflix, but you can unlock it right now in South Korea and start watching! With a few simple steps you can change your Netflix region to a country like Thailand and start watching Thai Netflix, which includes Now You See Me. We'll keep checking Netflix South Korea for Now You See Me, and this page will be updated with any changes. Now You See Me is not available in South Korea BUT it can be unlocked and viewed! A troupe of brainy illusionists specialize in stealing from banks and giving the cash to their audiences, all while outwitting a team of FBI agents. A miraculous illusion transforms Las Vegas magicians into modern-day Robin Hoods. Sure beats sawing a woman in half. There is a way to watch Now You See Me in South Korea, even though it isn't currently available on Netflix locally. What you need is a system that lets you change your Netflix country. With a few simple steps you can be watching Now You See Me and thousands of other titles! 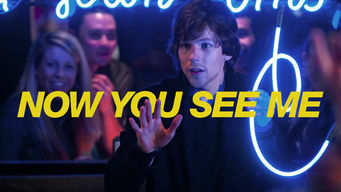 Watch "Now You See Me"